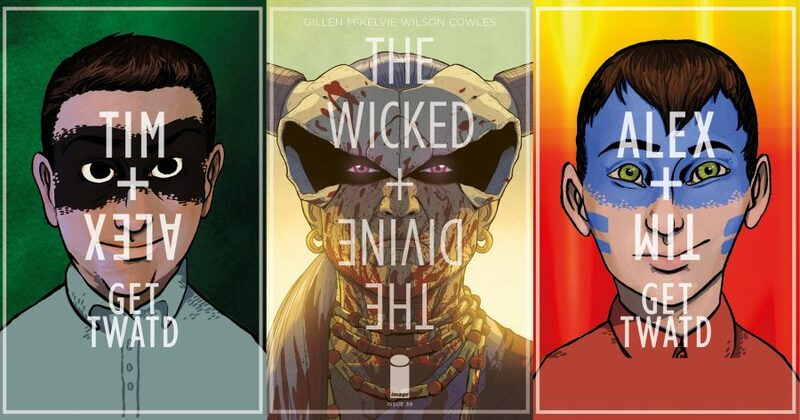 Once more, for the final time this arc, we return with two essays on the latest issue of The Wicked + The Divine. This time, Alex considers the ways that the Pantheon have sought to remain immortal, both literally and figuratively, and Tim examines how a rule system can be a cage, and how Persephone’s story has constantly sought to escape. Spoilers all the way up to issue #39 (and implied for the 1373AD Special) after the cut. Alex: At the heart of WicDiv’s premise, there is a deal. A severely shortened lifespan, in exchange for artistic immortality – or immediate fame and fortune, if you want to look at it that way. And a lot of the series, as it’s developed over the past four years, has been asking: who the hell would be willing to strike that deal? Being completely honest, at some points during those years – I’ve thought that maybe I would. Not for the fame or fortune, so much, but the idea of creating something that could last beyond myself. ‘Legacy’ has a nice ring to it, you have to admit. “Mothering Invention” has examined various ways people fantasise about achieving immortality. And has made it perfectly clear that this fantasy is foolish at best – and monstrous at worst. Let’s examine first the kind of legacy that once appealed to me: leaving a mark on the world through art. As this Pantheon approaches the end of their allotted years, it’s increasingly clear that none of them have created anything that will truly last beyond them. Look at the way the public talk about the gods in #37. Cassandra risking everything to speak truth will survive only as “reaction gif of the millennium.” Even Dionysus, the god who seemed to have the best grasp on his legacy (“they’ll remember being happy for a night”) is remembered as a troubled drug addict. The Woden of 1831 – the last true Woden to reincarnate – and her Creature. “You will go on long after we are gone,” Woden tells it, and for once we have no evidence to suggest she was wrong. Whether this Creature is the same as the ‘Zeitgeist’, the being “of living poetry and bleak lightning” which appears briefly in 1923, remains to be seen. But if we follow its real-world parallel – Mary Shelley’s Frankenstein and the genre it birthed, a lineage you can trace straight to WicDiv – the legacy remains strong. This isn’t the only kind of legacy that the 1831 Special touches on, however. Between Woden’s three children and Inanna’s pregnancy, it suggests a second way: creating not things but people, who will remember you. This is something we commonly talk about at funerals – “survived by their family” – and in many respects it’s a much healthier approach. It’s also the kind of legacy that Ananke seems most insistent on blocking. In 1831, we see the lives of Woden’s three children extinguished in the crib by Inanna, at Ananke’s behest, and the pregnant Inanna killed by Ananke herself. These are echoed in “Mothering Invention” by the revelation of Baal’s child sacrifices, once again at Ananke’s behest, and Minerva’s attempt to murder the pregnant Persephone. But to make life purely so it can extend your own is monstrous. That’s the way that someone like David Blake (or “Woden”) thinks – a man who uses his own son as a resource for his own gain. As it develops, “Mothering Invention” increasingly distances itself from this idea. Ultimately, Laura’s decision to terminate her pregnancy has nothing to do with her rejection of godhood, and the immortality that offers. In fact, as she makes abundantly clear in #39, it has nothing to do with any of us. 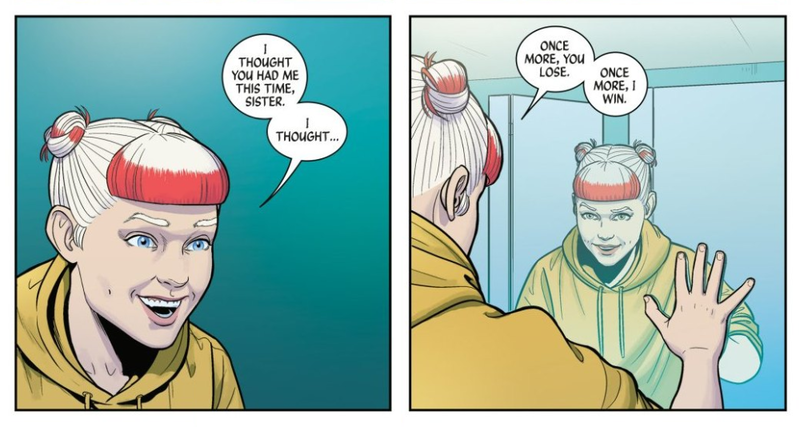 That same issue shows us that Ananke’s mythic motivation for killing all these children – a belief that it’s her immortality or theirs – is a trap, set for her by her sister. In the space of a dozen pages, the comic thoroughly rejects the idea that children are just another way of leaving a mark on the world. By the end of the arc, there’s only one character still desperately clinging onto attempted immortality: Ananke (or “Minerva”). And she’s the baddie. 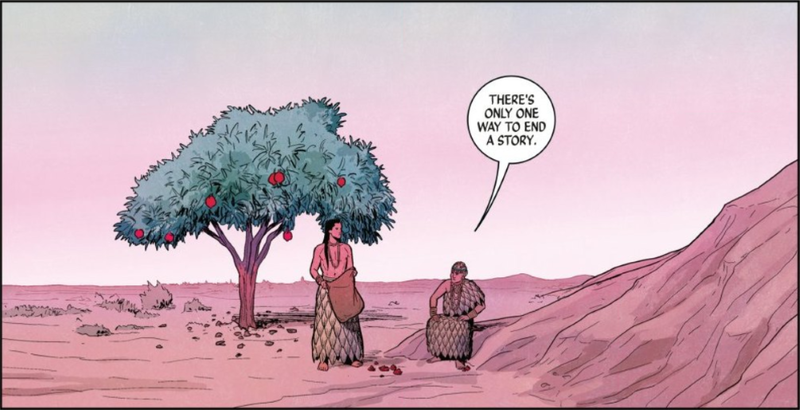 In Ananke’s case, it’s not that building a legacy is futile. She’s been incredibly successful, in a much more direct way than any of us in the real world could ever be. Not just living on in people’s memories – because what use is that when you’re spending eternity in endless dark, unaware – but literal immortality. It’s more that what she does to achieve this, an eternity of child murder, makes her a monster. Which is one way to make sure you live long in history, certainly. The Morrigan’s final act of abuse is to create something that will last beyond her death (albeit not by much), by making Baphomet a slave to her memory. 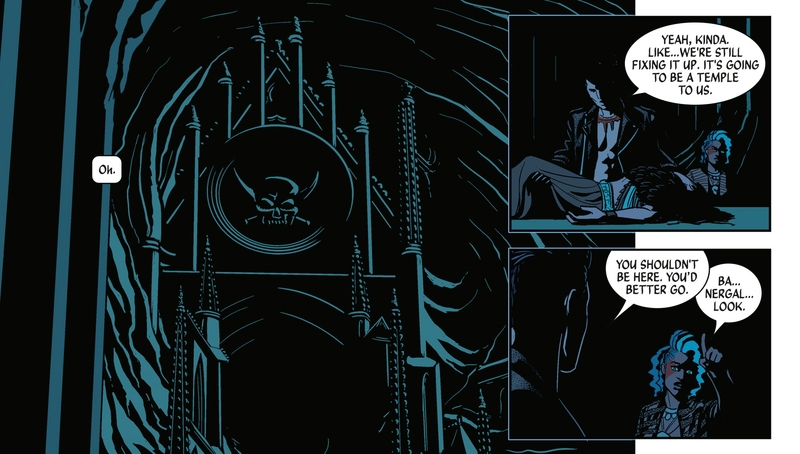 The meaning of that final moment in #37 has been hotly contested, but this seems to be Morrigan’s intent, given the reveal of her and Baphomet’s underground Temple of Love in the very next issue. Even if your intent or methods aren’t evil, though, it seems like WicDiv’s position on legacy is that it’s inherently selfish, or at least misguided. Most of Pantheon aren’t trying to leave the world a better place. And that’s completely fair enough, they’re all still teenagers. These gods are really just kids, still in the process of working out who they are – as Laura seems to have realised in the past couple of issues, why would they want to leave a legacy? After all, who’d want the things they wrote when they were 17 preserved forever? Only a fool, or a monster. There was a tweet a while back criticising games like Spec Ops: The Line for attempting twist endings where they shame players for their violent actions throughout the storyline, having only given them the traditional tools of a first-person shooter to progress through that story in the first place. I’m not sure it’s a critique that entirely works but there is a core of truth to it. When all you have is a hammer, everything looks like a nail, and when you are told the rules of a game, you expect the win condition to lie within those rules. Given Gillen’s background in video game journalism and the fact that his next project, Die, focuses on role-playing games, complete with a rules system designed for playing through the story, it’s no surprise that some of his thinking in this area has crept into The Wicked + The Divine. In issue #39, we get the twist that we’ve all been waiting for, Persephone’s fourth rule in the grand game being played across the centuries by her and Ananke. And then almost straight away, we find out that the rules don’t really matter – or rather, what matters is realising that the rules don’t matter. It is one of those twists that, in retrospect, we should have seen coming. Ananke is obsessed with both rules and roles. The Promethean Gambit. Baal’s sacrifices. Sky gods versus underground gods. Every time a god ascends, she is there, reeling off descriptors meant to shape how they behave, the particular slot that they will neatly fall into. As time has gone on, we’ve seen how arbitrary these names and roles are, even as multiple members of the Pantheon have been polished off in poetic circumstances. Ananke’s rules are meant to box the gods in, keep them predictable and operating according to her plans. More than that, we’ve seen literal boxes – or rather cages – again and again throughout the series. Lucifer’s glass cell. Woden’s neon prison for The Morrigan. Baphomet, held in the darkness of the Underground. Mimir, locked away behind the scenes. She may be free to come and go, but even Persephone’s secret hideaway has the feeling of a dungeon to it. Every time we see one of the characters stuck away in a cell, we want to see them break free, and Persephone’s rejection of her godhood is the ultimate jailbreak. Let’s go one level deeper, and focus purely on this arc. 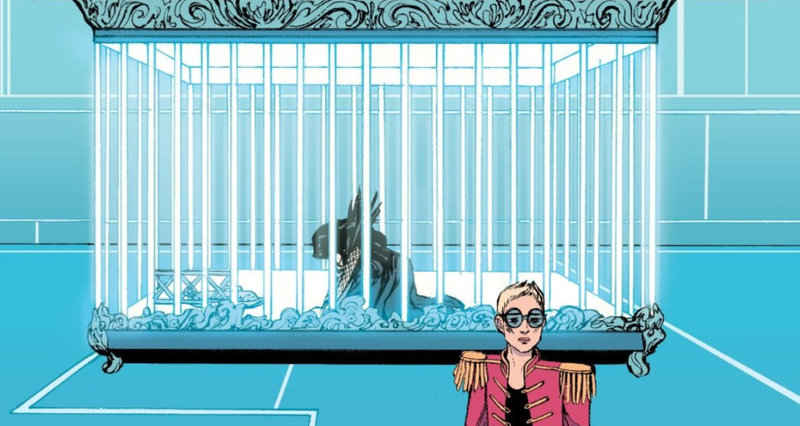 WicDiv has never been a series to shy away from formalist trickery, and this arc has been no exception. 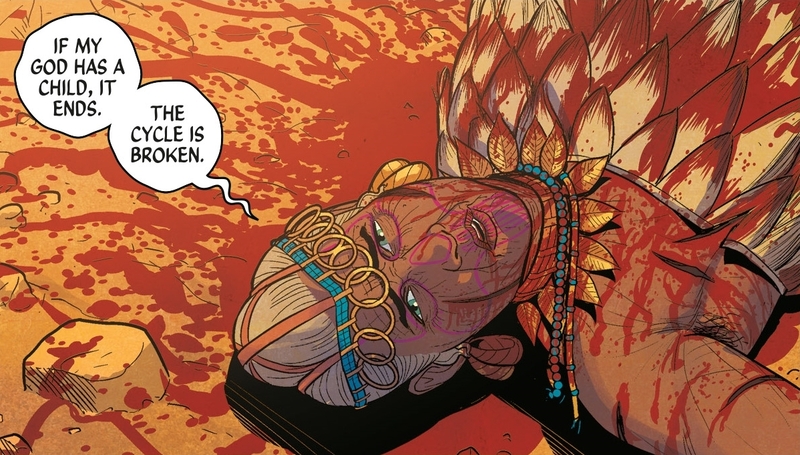 With issue #33 revealing new levels of Ananke’s plot and her connection to Minerva, the appropriately-named “Mothering Invention” has offered use a closer look at Ananke throughout the ages in opening flashbacks. We’ve seen her deadly encounter with her sister nearly 6,000 years ago, revisited a familiar scene from 1923 with new information, followed Ananke through the ages as she kills off Persephone, witnessed what she experiences if her plan fails, dipped into her fateful meeting with Robert Graves in 1944, and returned to the first scene to explore what happened before and after it. A nice consistent use of the flashback structure, each deployment bringing us new information, right? Except in practice, the structure has proved anything but consistent. In issue #34, we break with tradition and don’t get our usual time and place identifier – we are simply told it is “nearly 6,000 years ago”. In issue #35, we are revisiting a scene from the very first issue, albeit redrawn by McKelvie to reflect the growth and change he’s seen over the past few years. Issues #36 and #37 are complete departures, massive stylistic breaks that dominate the issues they come in, mirroring each other but also standing in complete contrast. 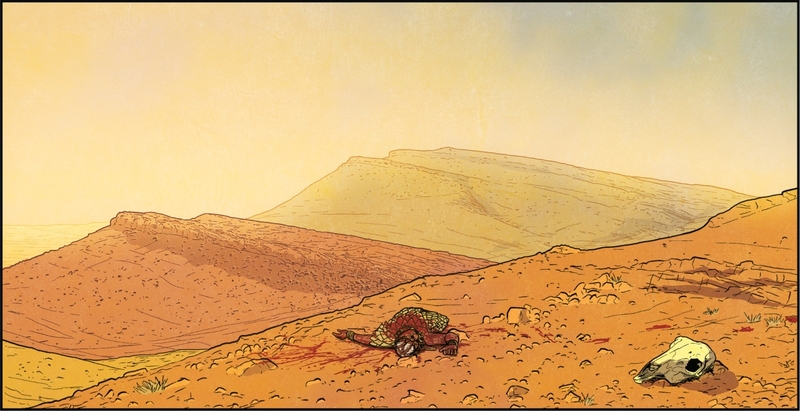 #38 is the closest to a return to format as we get, but after the first two pages, every page jumps forward in time, giving us tiny scenes that fill in blanks. And finally in #39, we circle back around to the initial flashback, letting it play out a few moments longer. Oh, and it’s not the first thing in the issue anymore. And later on, we’ll be jumping back before it to see Persephone’s true plan be hatched. You may ask so what? They’re all flashbacks, what does it matter if the format changes slightly every time? Well, if you’re reading this blog, you’re probably a close enough reader of The Wicked + The Divine to know that these kind of decisions are almost certainly deliberate. Gillen and McKelvie love their formalist structures, and the fact that there are so many inconsistencies between each flashback supports the idea of a story straining against its framework. 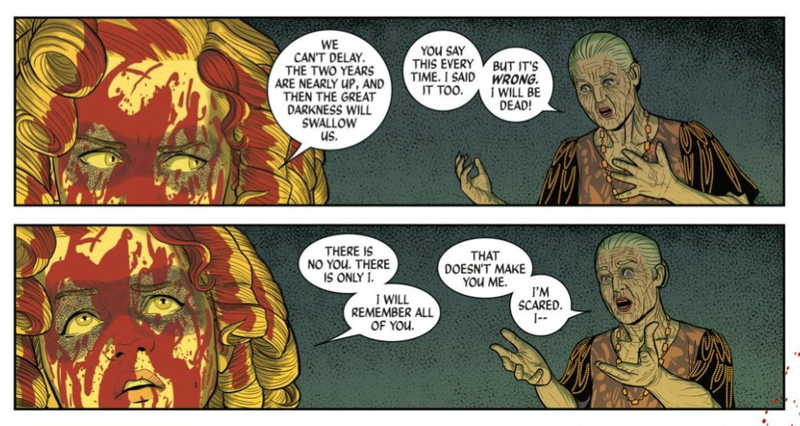 We’ve seen that Ananke would like each Recurrence to play out almost exactly like the last, but we also know that Persephone represents an x-factor in that plan. In each instance, the flashbacks show Ananke’s plan going wrong in some way. The initial creation of the game. The aftermath of 1923’s murderous weekend, with an elderly Ananke who, at the end, is unsure and hesitant. The missteps and variations that occur over 6,000 years of Recurrences. The existential horror of her plan even temporarily failing. A drunken mistake where she reveals a little too much. And finally, the true nature of the game, revealing that Ananke’s plans have always been built on a false premise. The architecture she has constructed across the generations to support her agenda is imperfect, and in this issue we realise why. She is so focused on winning the game that she can perceive that she has never taken a step back to wonder whether it actually matters. This brings us, after much meandering, back to two of WicDiv’s central themes; mortality and art. If you are constantly grinding away to succeed in an artistic pursuit, chasing the muse, churning out content for the content god, there surely comes a moment when you step back and ask “What does a win look like?” Even if you have achieved great success by the measures of your industry or your peers, are you actually playing the right game? And similarly, when you are faced with the realisation that, no matter what you do, you’re going to die, it’s going to lead to some introspection about what it is you’re pursuing in life, and whether you’re just hewing to the path you’ve been set on by society, by family, by your own preconceptions. Persephone’s monologue at the end of the issue is all about facing these questions. Not necessarily answering them, but beginning the hard, hard work of trying to wrap your head around them and face them honestly. “All these stories of what I should do fell away,” she tells us. She rejects the labels and the narratives that have been forced on her, the structures that have attempted to cage her and turn her into something simple. Strip all of that away and you step outside the game, into that black void of self-reflection. It can be tough to see where you need to go from there, but Persephone can offer you a light, at least.